Their disadvantage is that the hot, dense regions which form the central engines of stars, active galactic nuclei and other astrophysical energy sources are completely opaque to photons, and therefore we cannot investigate the properties of these regions by direct observation, but only by indirect inference. For example, the photons we observe from the Sun come from its photosphere, far removed from the hydrogen-fusing core. Moreover, high energy photons interact with photons of the infrared radiation background and with the cosmic microwave background to create electron-positron pairs; this is the Greisen-Zatsepin-Kuz'min effect (GZK). This effect suppresses any possibility of surveying the sky over distances greater than 100Mpc with high energy (>10 TeV) gamma rays. 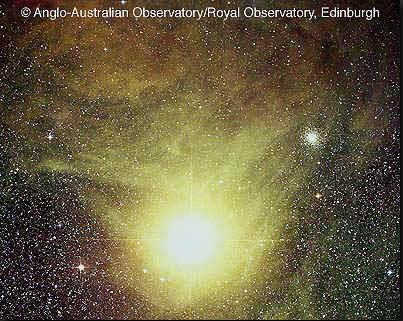 © Anglo-Australian Observatory, Photograph from UK Schmidt plates by David Malin. Some astrophysical sources are known to emit neutrinos: hydrogen fusion produces electron neutrinos as by-products, and solar neutrino astronomy has a 30 years long history; the conversion of iron nuclei to neutrons when a neutron star is formed in the heart of a supernova produces a burst of neutrinos (augmented by the thermal production of neutrino-antineutrino pairs), and one such burst was observed by Kamiokande and IMB for Supernova 1987A; cosmology predicts a low-energy relic neutrino background similar to the low-energy relic photons of the Cosmic Microwave Background, but these would have an effective temperature of around 1.9 K and are very difficult to observe. Primary cosmic rays are protons, with some admixture of heavier nuclei; the energy spectrum is a power law which extends to extremely high energies, values exceeding 1020 eV having been observed in recent years. Protons themselves have limited use as astrophysical information carriers because they are charged, and therefore subject to deflection by cosmic magnetic fields: only the very highest-energy cosmic rays are likely to retain any memory of the source direction. The exact source of the high-energy cosmic rays is thus unknown, although supernova remnants and active galactic nuclei have been proposed. Whatever the source, it is clear that accelerating protons to such high energies is likely to generate a large associated flux of photo-produced pions, which decay to yield gamma rays and neutrinos. These will remember the source direction, and so the existence of a general flux of very high energy cosmic-ray protons implies the existence of sources of high-energy neutrinos. Neutrino astronomy thus offers the possibility of observing sources which correspond to the central engines of the most energetic astrophysical phenomena. It can also provides long baselines for neutrino oscillation studies, and can explore useful regions of supersymmetric parameter space in the context of dark matter. The drawback, of course, is that the weak interactions of neutrinos imply that a very massive detector with extremely good background rejection is required to observe a measurable flux.